When the 88 metre Perini Maltese Falcon burst onto the yachting scene in 2006, she was hailed as revolution in superyacht design. What made her so different is her patented Falcon Rig, using freestanding, rotating spars that carry canvas reminiscent of the square-riggers of old. The square-rigger concept had seen its heyday fall as steam took over, making ships more efficient and requiring less crew. The last trading square-riggers disappeared in the 1950s. But necessity being the mother of invention, the 1973-74 OPEC oil embargo had ship owners looking toward sailing ships once more. A German hydraulics engineer, Wilhelm Prölss, proposed a DynaSchiff, a 160 metre bulk carrier with six steel tripod-masts. It used the DynaRig sail he first posited in 1967, in a research project studying the efficiency of many different sail concepts for commercial shipping. When the coefficients showed the DynaRig concept to be twice as efficient as conventional square rigs, the idea became credible. But in spite of being promoted heavily in technical papers, the idea was untested at full scale until American venture capitalist Tom Perkins decided to use it to power Maltese Falcon. Part of the reason the rig had never been built was that technology in the 1960s and 70s was not advanced enough to make lightweight spars  even as a tripod instead of a single pole. It was too heavy, hydraulics were not advanced enough in the marine world to be reliable, sail controls required many people and roller furling systems were in their infancy. But with advances in carbon fibre and fibre optic sensor technology, roller furling sails, computer optimisation of sailing angles and reliable hydraulics, the DynaRig was finally feasible for a large vessel. 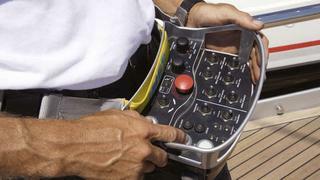 The rig now known as the Falcon Rig was designed by Dykstra Naval Architects, Damon Roberts of Insensys and Perini Navi under Perkins direction. 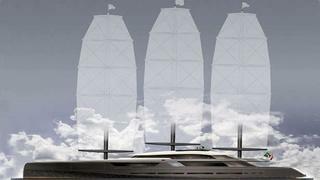 In 2001, Dykstra had investigated an optimal sail plan for an environmentally-friendly, large, world cruising project. Evaluating all possible hard- and soft-sail options, for that project, they chose an Aerorig schooner, with the DynaRig a close second. At that time, however, the construction of a carbon fibre DynaRig was cost prohibitive. But Dykstra saw the value of the DynaRig and showed it, along with a traditional and modern square-rigs, a schooner rig and a sloop, to Perini Navi and Tom Perkins as potential sail plans for the existing 88 metre Perini Navi hull that would become Maltese Falcon. Perkins, a laser engineer by training, was intrigued by the DynaRig, enough so to buy the patent rights and residual technology originating with Prölsss DynaSchiff from the German government, which included reams of testing data. Perkins set up a company to build the carbon fibre spars on site with Fabio Perini designing the small captive outhaul motors that unfurl and tension the sails and the mandrel that winds them back into the mast. The design engineering and concept has proven itself since the yachts maiden voyage in 2006, consistently delivering speed under sail at 16 to 20 knots. 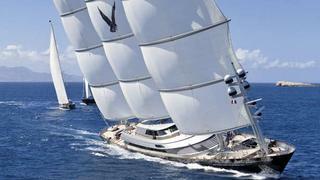 With the success of Maltese Falcon and the research done by Dykstra Naval Architects, it would appear that such a rig could have a successful future for large yachts. But in a note to us, Gerard Dykstra mentioned that the response has been slow in coming. To date the company now has refined the rig for a yacht under construction at Oceanco, is working on an 8,000 DWT cargo ship to be called the Ecoliner, and has researched the concept of two-masted yachts with Perini Navi and Ken Freivokh, who did the styling and interior design for Maltese Falcon. For Freivokh, it has been an ongoing mission to promote the Falcon Rig concept, but an uphill struggle. When asked how quickly after Maltese Falcon people started enquiring about the concept, his reply is short. Not quickly enough! he quips. We spoke to many people and it created quite a bit of stir and interest. People would talk to us but would then say that they didnt want to be seen copying Maltese Falcon. Of course, my answer was that instead of copying the Falcon they were going to copy everybody else by having a conventional mast with spreaders and all the normal paraphernalia.